When My Feet Go Through the Door: Lenten beer? The start of Lent last week got me thinking about why, in England at least, there are no beers associated with this part of the liturgical calendar. Strong, malty beers are drunk in Lent elsewhere in Europe. 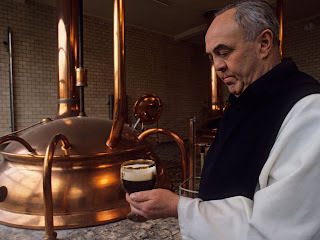 The Doppelbock known as Fastenbier in Bavaria and the high-gravity Trappist beers of Belgium were both supposedly first brewed by monks as sustenance, "liquid bread", when fasting in Lent. Whether that's true or not, it does show that at least some of our continental cousins see beer as an essential part of daily life, rather than an occasional luxury, which also reflects different attitudes to drinking in Catholic and Protestant areas.